Our exclusive in-house Bell-Like Tuning graces each Sankyo Orpheus Movement. songs or parts, and feature Sublime Harmony Tuning. two or three songs or parts. These movements make wonderful gifts for any occasion (Christmas, anniversary, birthday, graduation, business event, or ... ) and will be treasured for decades. For those of you who are interested in something extra-special for that extra-special someone; a music box like this would definitely fit! But we warn you in advance; you may have difficulty parting with it once you have it! 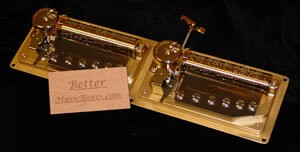 We also offer 50 & 72 note movements in Large Music Boxes. We also plan to offer 100 note movements in Large Music Boxes. But if you'd prefer to make your own box, these high quality musical movements will complement your work beautifully! Each movement comes complete with everything you'll need to install it (even down to a drilling template and decorative tune label). Our woodworking specialist will be glad to advise you if you need any help.